This traditionally is not a story about 4-H promotion. But it conveys the impact a story can have. Printed, and reprinted, in the national 4-H magazine, National 4-H News, not once but three times over the course of several years, with the heading at least once as “The Greatest Story Ever Told,” it represents a certain type of 4-H-related story that has appeared from time to time throughout 4-H’s long history. Eugene Evers grew up on a farm in Forest Grove, Oregon. An 8-year 4-H’er, his father was the club leader. His 13 brothers and sisters were all members. Eugene’s main project was his Holstein dairy herd. He milked 30 cows a day and was assistant secretary of the Oregon State Holstein Association, although still in his teens. With these qualifications he won a trip to the 1949 National 4-H Congress in Chicago where he was selected a national dairy winner, winning a scholarship. A year later Eugene Evers enlisted in the Air Force and was sent to the Orient. 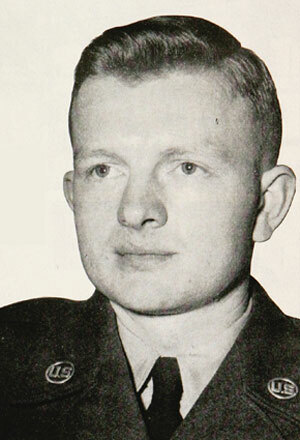 He was reported missing in action over North Korea in July, 1952, being captured after volunteering for a mission. Airman Evers became a prisoner 36 hours after his plane went down and was placed in solitary confinement for seven months. He was then transferred to Mudken, China, and again placed in solitary confinement, allowed to leave his 9 x 12 foot cell only twice during the next 7 months… for interrogation. The 14 months Eugene was in solitary confinement was not at any time in a prison camp, a fact considered by the military as meted out only to prisoners deserving the most severe treatment. His family received no word about the young man. His sister recalls that late every afternoon as they were milking cows, the radio would announce the names of any prisoners of war which had been released. The young brothers and sisters would sit on the bales of straw and anxiously listen to the report… but never any mention of their brother. Then, one day the announcer casually read off the name of Eugene Evers from Oregon. His sister said “it was like the 4th of July as they all hugged each other and cried, before racing to the house to inform their parents. This is how Airman Eugene Evers kept his sanity… reliving his experiences and those discussions at 4-H Congress – over and over and over again. We often hear delegates to Congress, to 4-H Conference, and other 4-H events describe their experience as “A Precious Lifetime Memory.” More so than we realize. But national dairy winner Eugene Evers from Forest Grove, Oregon’s story undoubtedly must be near the top of the list. In some ways it really may be the greatest 4-H story ever told. This entry was posted in History and tagged Eugene E. Evers by Larry Krug. Bookmark the permalink.